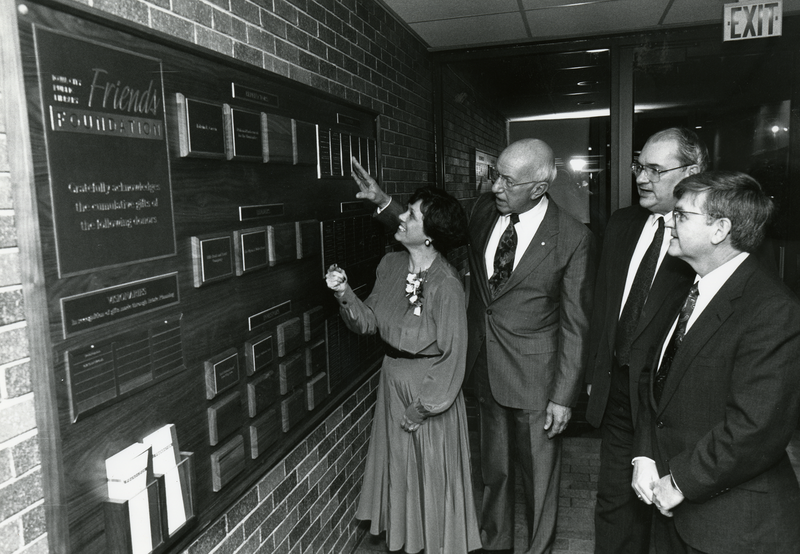 Iowa City Public Library Friends Foundation celebrate merger with a new Donor Wall. Marv Hartwig, President, Dave Johansen, treasurer, Kent Swaim, Library Trustee President, and Deborah Sales, Director of Development are shown with the new cumulative giving wall that was unveiled during a celebration held in connection with the merger. Over 100 individuals and businesses have attained various giving levels through cumulative gifts to the library. Iowa City Public Library, “Raising Money for the Iowa City Public Library,” Iowa City Public Library, accessed April 24, 2019, http://history.icpl.org/items/show/2721.